The Book of Kells is the lavishly decorated and exquisitely detailed illustrated manuscript produced by Celtic monks around AD 800. With its technical brilliance and beauty it is considered one of the masterpieces of Western Art and a symbol of Irish nationalism. This must be the book which the Welshman, Geraldus Cambrensis, saw at Kildare in the last quarter of the twelfth century and which he describes as the work of an angel. Although interlacing design is featured in the art of many cultures around the world, some of the finest knot-work interlacing was developed by the Celts. In common with other ancient peoples, imitation of the works of the Creator were forbidden, hence the strange yet graceful abstractions of plants and animals created by the Celtic and Pictish artists. 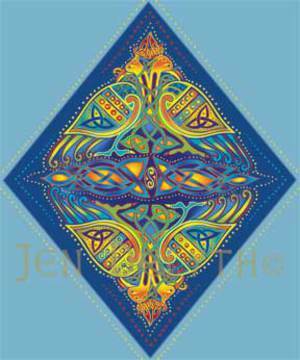 These birds are inspired by the stylistic figures and bright colors of the Book of Kells.